Camping Les Chapelains ★★★ is a human-sized campsite. Far from the chains and groups that industrialize and standardize camping holidays, we give you an opportunity to recharge and to reconnect with your family, children, friends, lover, for a weekend or holidays. Come and enjoy the warmth and sunshine of southeastern France, in the shade of the poplars and on the banks of the Drôme river for a refreshing swim in the river, our natural swimming pool. Calm, warm atmosphere, relaxation, slow tourism: we want to make your stay unforgettable, because our best recognition will be to welcome you once again when you come back to Saillans at the campsite Les Chapelains ★★★. Under the poplars: bordered to the west by a stone wall that runs along the Chapelains creek, this area is close to the bar, the restaurant and the sanitary facilities. The flat and grassy sites are delimited by hedges, in the shade of the poplars, or more exposed to the sun. The Drôme river is very close, just behind the dam and beyond the ramières. Electricity is available on all these sites. Their surface area is between 80sqm and 100sqm. This is an ideal way to discover the experience of holidays in canvas accommodation, with real beds just like at home and unlimited access to the sanitary facilities of the campsite. The Muscade Canvas Bungalow offers you an area of 16sqm, 2 bedrooms with fly-screen windows and blackout blinds separated by a canvas wall. One room is equipped with a 140 × 190 cm double bed, the other one with a 80 × 190 cm bunk bed and a single 80 × 190 cm bed. The living room has a kitchen cabinet and opens onto the covered wooden terrace at the edge of a large field with an unobstructed view of Mount Cresta. Pet friends not allowed. Non-smoking accommodation. After visiting Sardinia, Spain and Croatia, our vintage trailer tent has come to retire in the Drôme. True “vintage” camping with improved comfort! It is a tent, mounted on a trailer chassis. It remains timeless for those who appreciate its living space, and its comfort far superior to a traditional tent. The vintage trailer tent is installed in the wooded area of the “ramière”, on a shaded pitch. Equipped with two bedrooms on a platter, the trailer tent offers you a comfortable sleeping on its two 130 × 200 cm bed. The large awning of 11sqm provides an appreciable space to cook in the kitchen cabinet or to relax in the shelter of the sun. Pet friends not allowed. Non-smoking accommodation. Coco Sweet is a new concept of unusual accommodation, both functional and comfortable, playful and cozy, fully equipped. This modern-time gypsy wagon offers you the same comfort as a static caravan (without sanitary) and a unique look with its ingenious room setups. The soft light bathes the atmosphere thanks to the translucent walls at the ends. The blackout curtains and the insulated roof allow you to enjoy the night for a restful sleep. For your safety, Coco is closed by a real glass door. Located near the communal facilities or closer to the river, in the wilder more natural “ramière” area, the 2-bedroom Coco Sweet offers a surface area of 16sqm, with a bedroom with one 140 x 190 cm double bed and a bed room with two 80 x 190cm sofa beds. In-between is the living room with storage, a folding table and 4 stools, refrigerator and microwave. Pet friends not allowed. Non-smoking accommodation. An ideal cocoon to get together as a couple, disconnect and relax in a natural environment. Coco Sweet is a new concept of unusual accommodation, both functional and comfortable, playful and cozy, fully equipped. This modern-time gypsy wagon offers you the same comfort as a static caravan (without sanitary) and a unique look with its ingenious room setups. The soft light bathes the atmosphere thanks to the translucent walls at the ends. The blackout curtains and the insulated roof allow you to enjoy the night for a restful sleep. For your safety, Coco is closed by a real glass door. With a surface area of 12sqm, Coco Sweet 1-bedroom opens on an equipped entrance with storage, folding table and stools, refrigerator and microwave. Behind the entrance is the bedroom with the 140 x 190 cm double bed. To enjoy the sweetness of the Drôme, the covered-terrace offers an unobstructed view of the Mount Cresta. Pet friends not allowed. Non-smoking accommodation. Under the poplars: bordered to the west by a stone wall that runs along the Chapelains creek, this area is close to the bar, the restaurant and the sanitary facilities. The flat and grassy sites are delimited by hedges, in the shade of the poplars, or more exposed to the sun. The Drôme river is very close, just behind the dam and beyond the ramières. Electricity is available on all these sites (at extra cost). Their surface area is between 80sqm and 100sqm. View of Mount Cresta: close to the bar, restaurant and sanitary facilities, this area offers a clear view of Mount Cresta. You enjoy the sun when you wake up. It fades in the evening behind the poplars to bring you shade before dark. The Drôme river is nearby, just behind the dike after the ramière. Electricity is available on all these pitches. Their surface area is between 80sqm and 100sqm. Formerly used as the reception for the camp-site, the “Chalet du Haut” is a simple and rustic accommodation for 2 people (two 1-person beds), located at the entrance of the campsite. It enjoys the shade of a beautiful maple, and in the evening of the setting sun. It is equipped with a kitchen area with 1 cooking plate and microwave, a toilet and a bathroom sink (cold water). It is popular for hikers or cyclists. It has a private parking space. Pet friends not allowed. Non-smoking accommodation. An ideal inexpensive accommodation to spend a few nights during a hike or bike ride, a canoe trip on the river Drôme or short stays. The Cheyenne Tipi is a 3-person tent with generous dimensions. With 3m10 of height, no need to crawl to access your sleeping area. Its large mosquito net entrance door with its two masts forms an awning. Inside, there is a generous living space and a spacious bedroom. It is equipped with 1 person beds (slatted frame and mattress). Gas stove, electricity and fridge available as an option. Perfect for shelter from the rain and a short stay. Plenty of shade. we very much liked the location in the ramieres. the owners were very polite, helpful, open. they made a remarkable effort to speak to everyone in their own language. they organised / helped organise nice activities, both for kids (football tournament, 'fox hunt', clowns-evening) and for adults (wine tasting, concert, tour in local wine 'cava'). we had no problem with noisy neighbours, but heard other people had sometimes. nice location, 'close to nature', close to the river. when it became more busy (eventually the camping was full) it was a bit crowded, but we still felt we had plenty of room available. It was quite bright at night due to the big street lanterns burning all night. Not easy for sensitive sleepers when staying in a tent. 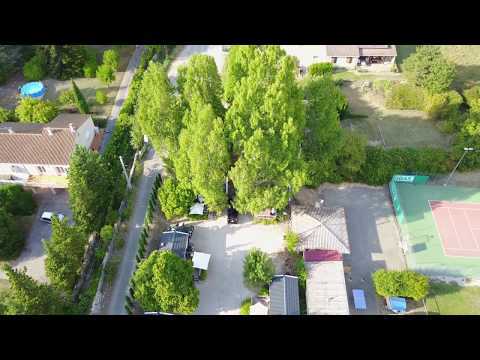 Un camping calme et bien situé à côté de la Drôme et proche du centre du village. Des sanitaires propres. Une équipe sympathique. Un bon compromis entre tente et bungalow qui fait profiter du camping avec un peu plus de confort (literie, table, vaisselle...) et d équipements (frigo, gaz...). Tout est neuf et propre ce qui est très appréciable. Bon séjour en général ! Des gérants de camping présents mais pas envahissants De bons petits plats ( poulet fermier de La Drôme, ravioles et de bonnes pizzas !) Une délicieuse soirée paella 菱 accompagnée d’un Bonne musique  Des sanitaires très propres ! Et la rivière juste à côté ! Un petit village sympathique 15 minutes à pieds! Il manque peut-être un ou deux transats pour les siestes à l’ombre des arbres ! De vrais lits ! L’espRit camping avec le confort en plus !